At the opening session of the 20th International AIDS Conference in Melbourne, international actors emphasised the need to intensify the fight against HIV/AIDS. The joint United Nations programme on HIV/AIDS (UNAIDS) highlighted the progress made globally, and especially in developing countries. According to a UN report (16 July), AIDS-related deaths fell considerably in 2013, although they still accounted for 1.5 million deaths. New HIV-infections also fell from 2.2 million in 2012 to 2.1 million in 2013. The number of people with access to life-saving medicines increased. In 2013, 2.3 million extra people received treatment which in turn reduced further infections. 76% of people in Sub-Saharan Africa are unlikely to transmit the virus thanks to antiretroviral therapy. Despite these positive developments, Sub-Saharan Africa is still the worst affected region in the world. Ten countries (Nigeria, Ethiopia, Uganda, Kenya, Tanzania, Zambia, Malawi, Zimbabwe, Mozambique and South Africa) represent 81% of people living with HIV in the world. Numerous countries have yet to make significant progress in tackling HIV, such as Nigeria, Democratic Republic of the Congo and South Sudan. According to Khalil Elouardighi, campaigner at Coalition Plus (NGO that brings together organisations tackling HIV/AIDS), ongoing conflicts in Central African Republic, Congo and South Sudan mean these fragile states struggle to get the full potential from foreign aid. Nigeria has large oil supplies but has not invested back into the country’s public health system. Elouardighi believes that this explains the countries bad results in tackling the HIV epidemic. During the conference in Melbourne, UNAIDS’ Executive Director Michel Sidibé announced new targets for 2015. ““If we accelerate all HIV scale-up by 2020, we will be on track to end the epidemic by 2030,” he said. To achieve this, he argues that 90% of the global population should be screened, and 90% of people with HIV should be treated. In an attempt to strengthen European cooperation in international development aid, eleven EU member states envisage a European financial transaction tax, part of which would fund foreign aid. France has been a driving force behind this initiative. “France has an important role to play in negotiating a European financial transaction tax (FTT). We expect a lot from the French government,” said Khalil Elouardighi. 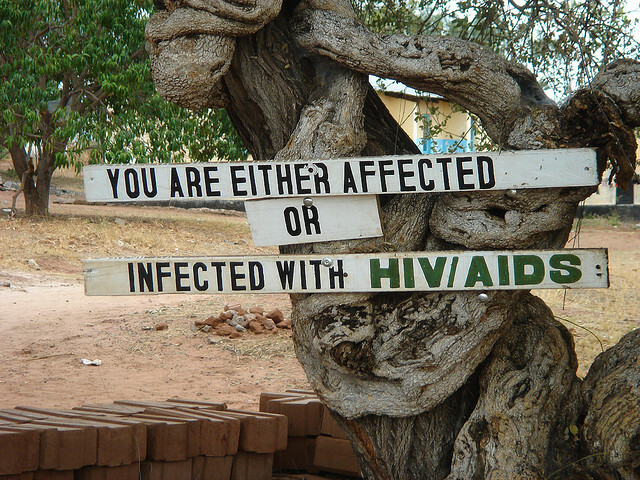 There are currently two main sources of finance for campaigns to tackle HIV/AIDS. National finances represent 50%. The other half comes from international aid. This can be split into two main sources: bilateral funds, which are financed by agencies or between states, and multilateral funds, notably from the Global Fund to fight AIDS, tuberculosis and Malaria. The Global Fund is financed by organisations and states. 21% of its international grants is invested in tackling HIV/AIDS. For example, France prefers to participate multilaterally. It has promised to give the Global Fund €360 million in 2014, 2015 and 2016 – making it the biggest European donor and second-biggest contributor in the world. It has also pledged €110 million financed by a solidarity levy on airline tickets to UNITAID, which ensures greater access to treatments and diagnostics for HIV/AIDS in low-income countries. Although countries like France have promised more donations, NGOs still fear the effects of the global economic crisis. The French NGO Coordination SUD is alarmed over the 9.8% reduction of French contributions to development aid in 2013. This will affect healthcare the most, the NGO says. “Reducing French contributions will end of crucial treatments for tens of thousands of sick people in developing countries. Is France ready to make that decision?” asked Éric Fleutelot, head of Sidaction and board member of Coordination SUD. In late 2013, the European Union decided to increase aid to the Global Fund to fight AIDS, tuberculosis and Malaria for the 2014-2016 period. The EU Commission presented an extra €370 million to the Global Fund over three years. This represents an extra €40 million compared to the previous contributions. Established in 2001, the Global Fund is a public-private partnership and global financial tool. Its aim is to increase financial resources to fight HIV/AIDS, tuberculosis and malaria. Over 12 years, the EU Commission has given the Fund over €1.2 billion from the general EU budget and European Development Fund which is capitalised by EU member states.